We are very excited to announce that Hillcrest Pharmacy was awarded Outstanding Pharmacy for the 2011, 2014, 2018 Nicky Awards which honors outstanding achievement in the community. 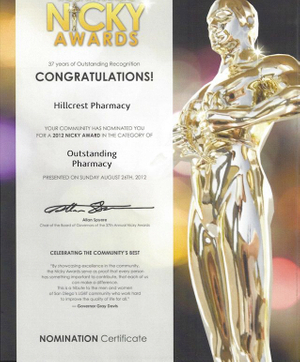 Hillcrest Pharmacy was nominated for Outstanding Pharmacy in 2012. 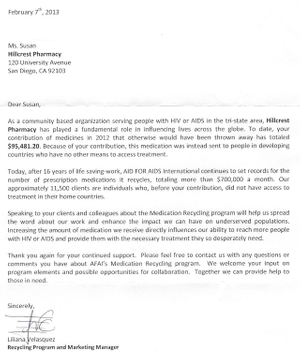 Hillcrest Pharmacy has been recognized by Aid For AIDS International as a community based organization serving people with HIV or AIDS and playing a fundamental role in influencing lives across the globe by contributing medicines that otherwise would have been thrown away. You can click the following link to learn more about Aid For AIDS Medication Recycling Program. Click the following link to view the complete Hillcrest Pharmacy Aid For AIDS Letter.